MANILA, Philippines – A patient inside an ambulance didn't make it when a traffic enforcer flagged them down and refused to let them go. 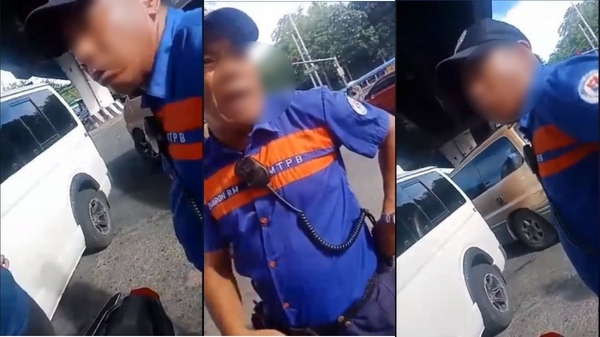 A Facebook post shared by Dan Russell Santos a video showing an altercation between an ambulance driver and a Manila Traffic and Parking Bureau (MTPB) officer. According to Santos, the ambulance was on its way to the Philippine General Hospital (PGH) to bring a patient, another MTPB officer who had a heart attack. Since the ambulance was in a hurry, it tried to make its way around the traffic. The enforcer flagged down the ambulance and tried to give them a ticket for apparently causing traffic. The ambulance driver tried to argue that they have a patient who is in dire need of medical assistance but the enforcer didn't back down. The traffic enforcer insisted that the ambulance has no right to go ahead of everyone else. The post has gone viral with over 138,00 views and 43,000 shares to date. After the video has gone viral, Raffy Tulfo of Aksyon sa Tanghali reached out to Dennis Alcoreza, chief of MTPB. Alcorez admitted that he heard of the incident due to the viral video. Alcorez confirmed that an investigation will be made and the enforcer is expected to appear in their office on Thursday. He said that if the enforcer was proven to have violated protocols, he can be removed immediately. He, however, clarified that the patient’s death was not because of the said traffic enforcer. Under Republic Act 4136 or the Land Transportation and Traffic Code, motorists are required to give way to ambulances or other emergency vehicles.